Longview Vineyard is a family owned Australian winery located just outside Macclesfield in the Adelaide Hills. Set on undulating slopes with grapes as far as the eye can see, Longview has all the hallmarks of a beautiful winery. Established by brothers Peter and Mark Saturno, they moved from New York City to take on the challenge of producing premium, cool climate wines. Along with their family, they have quickly established Longview as one of the most awarded vineyards in the region. However, Longview is not just a premium wine producer. It is also a popular wedding destination with a much sought after function centre, it has gorgeous 4 star accommodation with breathtaking views and it has a popular Sunday tapas menu which will tempt your taste buds. If you were to survey 100 people and ask them how they would spend a lazy Sunday afternoon, a majority would say spending the day at the winery. That’s exactly what we did. Adelaide Food Central, along with other invited guests were treated to a private wine tasting followed by sampling of the new Sunday Tapas Winter Menu. Chef’s Stephanie Heaven and Louise Naughton have created a sumptuous Mediterranean style menu that can be enjoyed anywhere around the vineyard. The menu changes seasonally, and like all good eateries, use only the finest produce available. 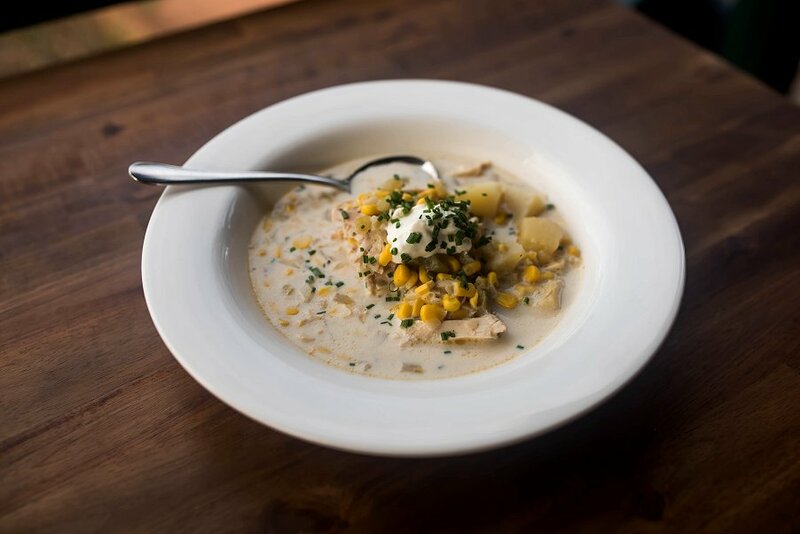 We started off with the Corn Chowder with house smoked shredded chicken and creme fraiche. The chicken was tender and succulent, with lovely smokey flavours. The potato cubes were firm but soft, while the corn kernels added a subtle crunchy texture. The soup itself had a light consistency and was a touch bland for our liking. Next was the Pan Fried Adelaide Haloumi with house smoked sweet potato and harissa salad. The thinly sliced haloumi was lightly browned on both sides. 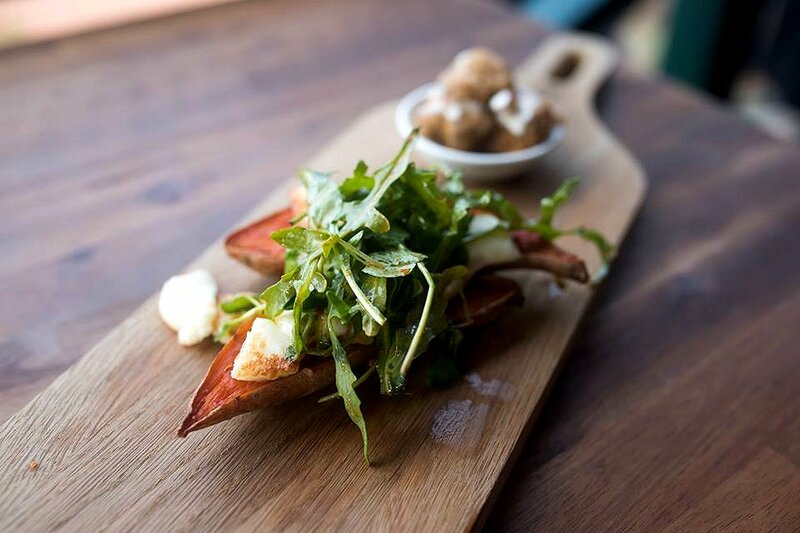 The saltiness of the haloumi was balanced by the natural sweetness of the sweet potato. The rocket in the salad was fresh and crisp, and the subtle heat from the harissa made the dish very exciting. 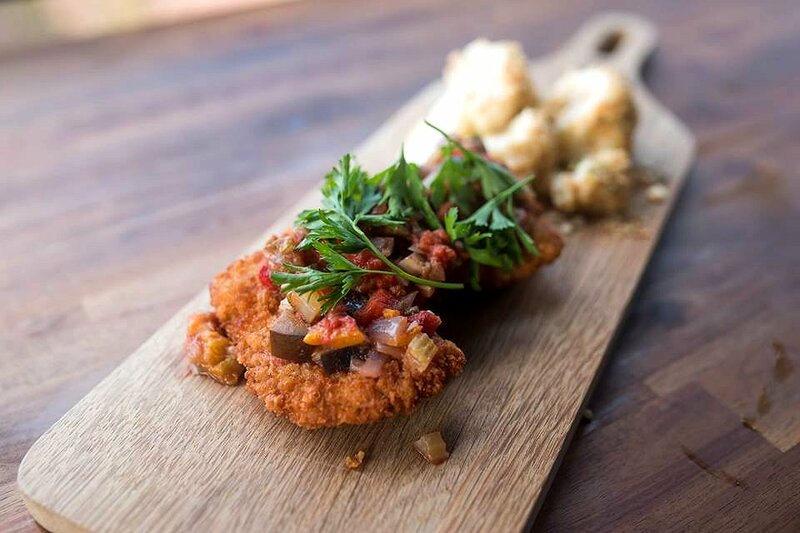 The Cauliflower Gratin was served with pork schnitzel and caponata. The cauliflower was soft and delicate, and smothered in a gooey cheese sauce. On the side was a juicy pork schnitzel that was fried to a dark golden brown. It was topped with a sweet caponata which balanced the dish well. All the elements worked well together, although we thought the schnitzel would have been the star of the show. 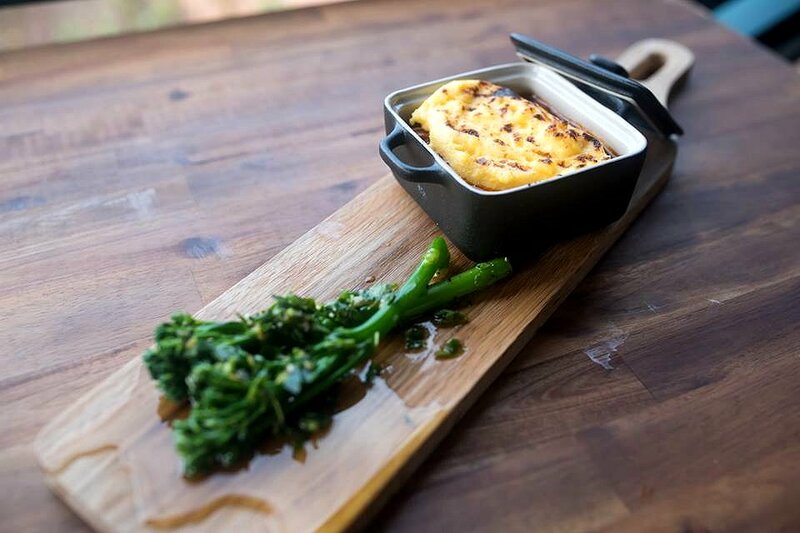 Our favourite was the Polenta Crusted Beef Ragu Pie with broccolini tossed in Gremolata. The beef ragu was simply amazing. It consisted of lean chunks of beef cooked in a well seasoned, rich tomato sauce. It was then topped with a polenta crust that was soft and creamy. The broccolini was firm and well cooked with notes of garlic and zest. As we always say, no meal is complete without dessert. 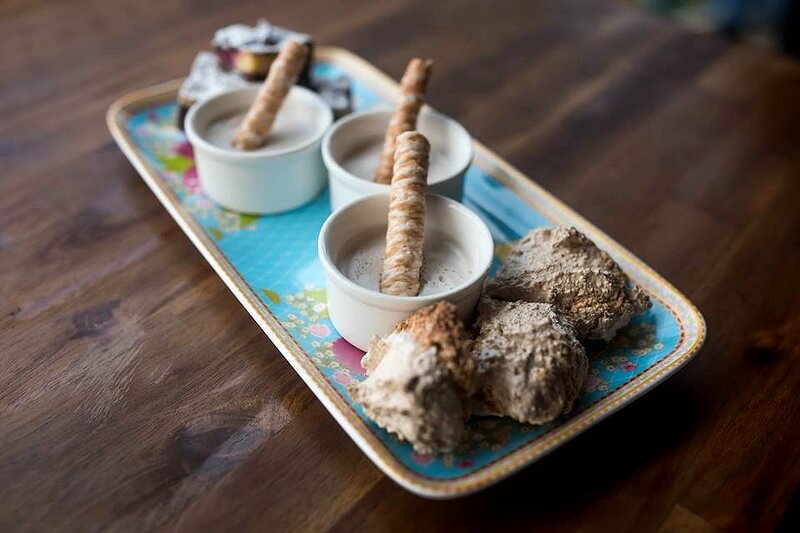 We were treated to a dessert tasting plate that had Hazelnut Meringue Drops, Chocolate Raspberry Cheesecake Brownies and Coconut Panna Cotta with Coconut Wafers. The Coconut Panna Cotta was light with a silky smooth texture. The hints of coconut reminded me of an Asian dessert. The wafers added a nice crunchy texture and further emphasised the presence of coconut. The Hazelnut Meringue Drops were light and airy with a firm chewy texture, while the Chocolate Raspberry Cheesecake Brownies were decadent with a natural sweet filling. Last but not least was the cheese. 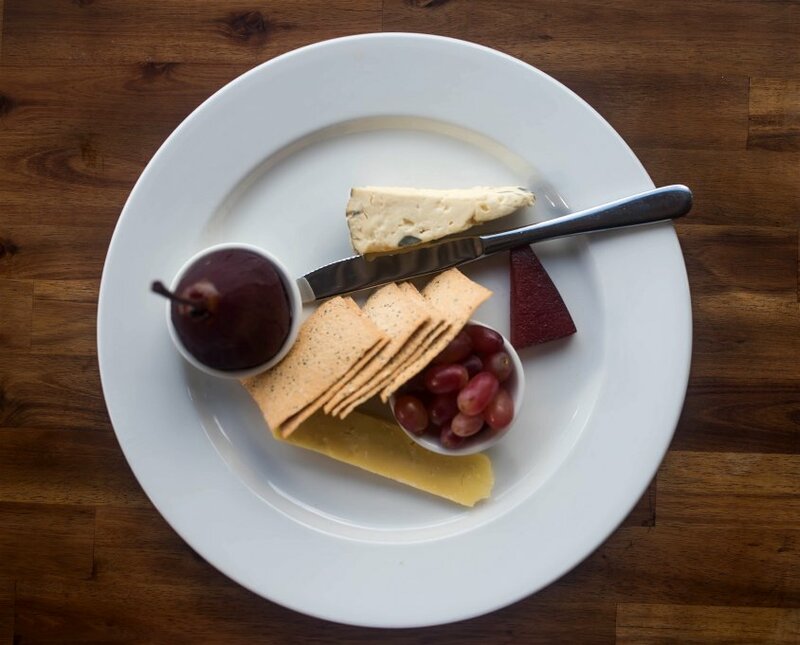 The two cheeses were Shadows of Blue and King Island Aged Cheddar. These were accompanied by lavosh, Yakka Shiraz spiced pear, quince paste and grapes. The blue cheese was soft and its pungency was moderate, while the aged cheddar was sharp with a lovely crumbly texture. What an amazing way to spend a Sunday afternoon! With picturesque views of the vineyard from the dining room table, we drank some amazing new release wines while grazing on the delicious Winter tapas menu. The location is perfect for weddings, a lazy Sunday afternoon or a place to stay the entire weekend. With some talented chefs in the kitchen, you’ll also be well fed during your visit. Longview Vineyard is what all wineries should be and it’s no wonder it’s a popular wine tourism destination in South Australia. Adelaide Food Central would like to thank Mark Saturno and staff at Longview Vineyard for their hospitality, and Sassafras PR for making the event possible.